A strange malaise has settled on the White Man’s thinking in the period following World War II. By means of the satanic propaganda impinging on his brain from every direction, the White Man is overwhelmed with a neurotic guilt complex. And what is he ashamed of ? Why does he feel guilty ? Evidently, he is supposed to feel guilty for the inferiority of the negroes and the other dark people. He is supposed to feel ashamed of his own astounding success in culture, in technology, in producing vast amounts and varieties of food, for creating civilization and learning, and a host of other most outstanding accomplishments. By today’s Jewish standards, success is failure, success is guilt. Failure and stupidity (as per the dark races) is good. Black is white, and white is black. Success (by the White Race) is to be condemned. Failure by the dark races is to be highly commended. Not only commended, but subsidized and proliferated – at the expense of the White Race, of course. As a result of this twisted, lunatic thinking, the White Race is desperately trying to assuage its “guilt” feelings by hopelessly trying to compensate for the negroes’ stupidity and the negroes’ inability to cope in a modern, White Man’s civilization. Somehow, in the deluge of Jewish propaganda, the White Man has completely overlooked the obvious” – that the negroe is innately backward, never can, and never will be able to cope or fit into the White Man’s civilization. Nor does the White Man consider the obvious fact that he is stupidly shrinking his own race in favour of an obsolete stone-age species of sub-humanity to whom he owes absolutely nothing. The Jew is thereby achieving his goal – to either exterminate or to mongrelize the White Race into a dumb, brown, subhuman monstrosity. This mongrelized product will then be subservient, easily controlled and never again pose a threat to the parasitic Jewish race. To fully appreciate how insane, how suicidal the present attitude and behaviour is, we have to go back to basics. We have to go back to the Laws of Nature and see what all the millions of other creatures are doing in regards to their own survival. In so doing, we find that today, as in the past many millions of years, we can discover not one single creature which has now, or ever before, adopted such a stupid self-destructive course. None, that is, except the White Race of today. Even among the inferior dark races there is none so stupid in this regard that say – “I will hold back the expansion of my own kind in deference to my adversaries and promote their welfare and expansion at my expense.” There is no creature in the animal, bird, insect or reptile category that says “in deference to a weaker, inferior species we will hold back our own expansion and development and promote our inferior rivals so that they can multiply and crowd us off the face of the earth.” There is no creature in Nature’s Realm that takes this stupid attitude – except the befuddled White Race. In order to get our thinking straight again on this vital issue, we must go back to the fundamentals of the real world – Nature’s Laws. When we do so, the answer comes out loud and clear. In every creature, Nature has implanted the urge for the survival of its own kind. Implanted instinctively in each creature, whether animal, bird, reptile or insect, is the urge to propagate, to multiply its own kind and to inhabit as much of this earth’s territory as is hospitable for that particular species. In order to spread its kind to the far-flung corners of the earth where hospitable territory may be found, each creature engages in colonization. Even plants, which we do not credit with brains or intelligence, seem to “know” what to do in this respect if they are to survive. They colonize vigorously and aggressively. The variety and ingenuity with which they do so is most fascinating. Although unlike birds and animals, they cannot walk, run or fly, they have devised the most proficient and resourceful means of spreading their seed over the face of the earth. The dandelion has tufts on its seeds and engages the wind to scatter its seeds over increasingly wider territory. Some, such as berries, cherries, etc., have an edible fruit around its seed so that it will be eaten by birds and animals and the seed carried to new territory after it passes unharmed through their digestive system. Some plants have runners in their root systems and thereby occupy more and more of the adjoining ground. Some plants, like the caragana, have pods that explode when ripe and scatter the seeds. Some plants, e.g., coconut palms, have floating seeds that will float from mainland to island and from island to island. Some seeds will float down rivers and take root on the banks. Some have burrs that will stick to the coats of animals and be carried far from their origin. There are countless other ways that are most extraordinary in their ingenuity, and some plants will utilize not only one method of expanding, but combine several. In one way or another, they have the urge to expand their own kind and their own kind only, even at the expense of all their competition in acquiring more ground, more territory. It is their unalterable goal to colonize in as many new places as they possibly can. Nature tells them that this is what they should do and what they must do. Many times, when a species is transplanted to a new habitat, it does even much better than in its original “native” habitat. For example, when the rabbit was introduced to Australia, where the area was devoid of natural enemies such as wolves, coyotes or foxes, its expansion was almost explosive. When the hyacinth was introduced into the canals and lagoons of Florida in the latter part of the nineteenth century, it sought to expand into every canal it possibly could, and was extremely successful in doing do. Nature tells every creature that it is not only its highest right to expand and colonize, but that it is also its highest duty. Every creature obeys this call. Every creature, even the negroes and the dark races pursue this natural urge. 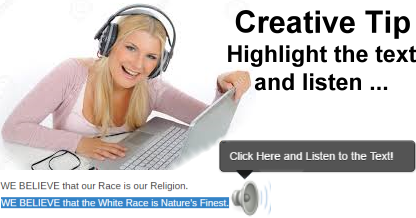 Every creature, that is, except the White Race in recent history. In the past, before its thinking was so poisoned by Jewish propaganda, the White Race was one of the most aggressive proponents of expansion and colonization. At the dawn of history, we find the Phoenicians, who were excellent sailors, establishing colonies in some of the islands of the Mediterranean, the shores of Spain, Africa and other areas. The Greeks, under Alexander the Great, conquered and colonized at a rate and on a scale unknown before. Although it was short-lived and explosive, the ramifications of that short burst of energy remain with us to this very day, as exemplified in such cities as Alexandria, Egypt, and others. However, the most meaningful programme of expansion in classical history was that accomplished by our proud White forebears, the Romans, during their thousand-year history. Unfortunately, this noble surge of the White Race collapsed when they fell prey to the same two vicissitudes that are destroying the White Race to this very day – (a) race mixing, and (b) Jewish mind-poisoning in the form of Christianity. The Jew was the prime instigator and promoter of both these poisons. When the Roman civilization collapsed at about 476 A.D., the White Race was plunged into a thousand years of the Dark Ages – a thousand years of ignorance, crime, superstition and poverty. After the Renaissance, in the 13th and 14th Century, the White Man slowly began to shift his thinking from the make-believe world of “spooks-in-the-sky” to the real world. He again began to bestir himself with new ideas and new energy. After Columbus discovered the New World, the White Man exploded into a new burst of energy and colonization : Portugal, and especially Spain, having newly freed itself of the Jewish plague, led the way. Over the next few centuries, the colonization and expansion into Cuba, Mexico, South America, the Philippines and other areas of the world, was nothing short of phenomenal. Lagging behind Spain about a century were the Dutch, the French and the English, with the latter gradually gaining the leading impetus. What the English nation did in the next three centuries in building the British Empire, is undoubtedly the most outstanding epoch of colonization in the history of the White Race, or any other race, for that matter. The culmination of this programme as far as the White Race was concerned, was the founding of the United States of America, albeit as an independent nation outside the realm of the British Empire. There was one tremendously significant difference between the colonization of the Portuguese and Spanish on the one hand, and the Anglo-Saxons, on the other. Whereas, the Spaniards had previously already taken in some mixed blood from Moorish and black African origins, the Anglo-Saxons guarded their White racial heritage. When the Portuguese and Spaniards transplanted to the New World they did so as adventurers and did not bring their women with them. Stupidly and criminally, they poisoned their genes by mixing with the inferior native Indians and the disastrous result can be seen today in the mongrelized inferior breeds that are their ignoble legacy. Poverty, ignorance, revolution and turmoil have marked the history of the Latin American countries to this very day. The Anglo-Saxons, to their eternal credit, did not intermarry with the inferior Indians, but by and large, kept their blood lines White, kept them pure. As a result, the United States, with only 5% of the population of the world (and a large proportion of even that 5% now being the parasitic negroes), nevertheless produces approximately half of all the substance of the world in terms of food and other goodies. Meanwhile, we look at the world situation today in the last quarter of the twentieth century. We ask ourselves, where is the White Race with its great and glorious legacy going today ? When we ask that question and take a hard, honest look at the answer, the realities send cold shivers up and down our spine. Today, despite the fact that the White Race has all the trump cards in its hands in regard to technological superiority, in terms of a monopoly on the armament of warfare, an overwhelming superiority in food production and every other key factor; despite all these, the position of the White Race is horrible. The White Race is rapidly shrinking and is being mongrelized. In the meantime, the dark races are multiplying like rats, not only all over the world, but right in the midst of the home territory of the White Race itself. The White Race is on the Road to Extinction. The superior is running before the inferior, and the inferior is pursuing – an insane phenomenon witnessed nowhere else in Nature. Have you ever seen a rabbit chasing a coyote ? Why is this colossal catastrophe happening to the most brilliant, the most intelligent race on the face of this planet ? Because, in the field of race and religion, its thinking is confused and befuddled. In the area of self-preservation, the White Race is more stupid than the weed that grows in your garden. Admittedly, when in the past the White Race vigorously and spasmodically ventured forth to colonize the four corners of the world, it did this, however, without any conscious programme of benefitting the White Race as such. What urge there was, was purely instinctive, without any basic plan or racial purpose. The motives in general were exploitation – commercial, national, or “empire building” as such and no interest was shown as to whether the new territory was polluted by negroes, Indians or other dark people, especially if such inferiors could be utilized and exploited financially as cheap labour. Despite lack of plan, programme, or a racial creed, the White Man worked wonders when we consider how he took over North and South America, Australia, India, parts of Africa, and many other vast areas of the world. Today, because of Jewish brain affliction, the White Man is no longer colonizing. On the contrary, he is apologizing and retreating on all fronts. The dark races, on the other hand, are multiplying like rats, not only in their native territory, but they are colonizing and overrunning the White Man’s established domain. The mixed mongrels of South America and Mexico are multiplying at an explosive rate, the Chinese are expanding rapidly and so are the Hindus. The negroes are multiplying like cockroaches and taking over city after city in America, a once wonderful country built exclusively by and for the White Race. And the reason these parasites are expanding at an insane rate is solely due to the work, technology and munificent (but stupid) charity of the White Man himself. We are turning over the fruits of our labour and technology to breed and feed the dark races so they can crowd us off the face of the earth, so they can more easily turn on us and massacre us as this macabre spectacle nears its finale. It is the goal and duty of Creativity to again straighten out the thinking of the White Race regarding its own survival, expansion and advancement. It is our unalterable objective to again set the White Race on the course it pursued over the centuries, only this time in a planned and deliberate programme. We must again clear our brains and revert to Nature’s Eternal Laws. We must again resume in a systematic, planned programme the policy of colonization that the White Race effectively pursued over the thousands of years. Instead of pursuing such a programme in a spasmodic, haphazard manner, we must, from here on out, proceed in a planned, deliberate, systematic programme. That programme must be : relentlessly pressing forward, expanding our territory at the expense of the dark races, crowding them into smaller and smaller territory just as we did the Indians in the westward expansion of America, and the Mexicans in moving South and West. We must vigorously and aggressively proceed until over the next few generations the White Race will have occupied all the hospitable and productive land on the face of this planet, every square mile that we consider worthwhile inhabiting. This is the highest right and duty that Nature bestows upon us. This is the legacy Creativity bestows upon those generations who will follow us. Before we can do this we must, first of all, stop the wild influx of free-loading dark races into our midst. Today, under Jewish promotion, the illegal Mexicans are invading the United States by the millions and the government is not lifting a finger to stop them. In fact, I strongly suspect that the Jew-dominated U.S. government is financing and aggressively promoting this influx. The United States are being invaded by Jamaicans, by Chinese, by Hindus, by Philippinos, by Cubans and by every other scum from all the corners of the globe. Germany has since the war taken into its midst huge numbers of Turks, Asiatics and other aliens. England is being overrun with Hindus, Jamaicans, Pakastanis and other coloured scum from many of its former colonies. Even Sweden, which before W.W.II hardly ever saw a negroe, now sees them walking its streets, often in tow of a blonde Swedish female. In short, colonization, due to the present stupidity of the White Race, is now reversed. The White Man has been run out of India, out of Katanga, out of the Congo, out of most of Africa, and will soon be driven out of Rhodesia and South Africa if our insane attitude continues. Not only that, but we will be overrun and exterminated in America, and in the countries of Europe, territory the White Man has inhabited for millenia. The Second Step we must take simultaneously with the first, is to cut off all aid – food, money, medicine, technical assistance, whatever, to the dark races, both here at home, and also abroad. No more subsidizing of our enemies ever, period. The White Man must realize that the Jew has led our people into a suicidal trap, has robbed us blind and subsidized the explosive expansion of our enemies at our expense. All foreign and domestic assistance to non-Whites must stop abruptly, period. The Third Step we must take after stopping dark migration into White countries, is to expel those coloreds already here. We must ship the American negroes back to Africa, the Jamaicans back to Jamaica, the Mexicans back to Mexico, the Cubans back to Cuba, the Chinese back to China, the Hindus back to India, etc. The same steps must be taken in England, Sweden, Germany, France, and all the other basically White countries. We must cleanse our own racial bodies from the scum of the dark races. The Fourth Step must be one of aggression. We can start by repossessing those beautiful islands in the Caribbean that the White Man discovered, developed, then dragged in the negroe and let them overrun and pollute these beautiful islands. Instead of allowing the Mexican mongrels to keep pushing the racial lines ever further north into Texas, New Mexico, Arizona and California, we must draw a suitable line south of our present border and drive the Mexicans south in successive stages until we have populated that fair territory with members of our own White Race. In so doing we would only be pursuing American policy and tradition where we left off in the war with Mexico of 1846-48. This is only the start. We will not rest until the entire world is the home of the White Race. The rest of the procedure need not be spelled out. We will know what to do once we get started. We have ample precedence in the building of America or the expansion of the British Empire. Nor is what we are proposing anything new. It is merely a return to sanity. The one feature that will be new is that we, followers of Creativity, unlike the British Empire, or even in the expansion of America, insist that those territories we inhabit we keep racially clean : 100% White. Never again must we fall prey to the suicidal idea that we need (or can use) cheap coloured labour. Never, never, never. As far as we Creators are concerned, in our technical age of electronics and atomic power, the negroe is more obsolete than the horse. Therefore, a cardinal rule of our religion must be : Not only will we not tolerate mixing of blood, but we will not tolerate geographic mixing of races either. As the White Man expands into new territory, that territory must be 100% White with an exact line of demarcation, until such time as that line is again moved forward. And moved forward that line will be, in a planned, systematic programme. To those bleeding hearts (led by the Jews) who scream, “But you can’t do that ! That is un-Christian ! That is genocide !” we calmly reply, “Yes, you’re damned right it is un-Christian. But then, fortunately, we are not Christians. We are Creators. We intend to follow our own programme, and we will.”Not to do so would be genocide of the White Race. We are far more interested in our own survival than see the world overrun with worthless dark races. Actually there is no choice. It is either the White Race or the dark races that are going to inhabit the limited space on this planet. If you are White you had better make up your mind whether you are going to join the White Race in its fight for survival, or you are stupidly going to play the traitor, and allow the White Race to be exterminated. We, followers of Creativity, intend to put every White Racial Comrade in a position where he or she will be forced to take a stand – either for the White Race, or against it – either demonstrate loyalty to the White Race by word, deed and action, or be branded a traitor to it. In our future, there will be no Mr. In-betweens. We will ruthlessly identify, pursue and prosecute racial traitors. We will hunt them down like mad dogs. They will get their just deserts for their foul treachery – death by hanging.